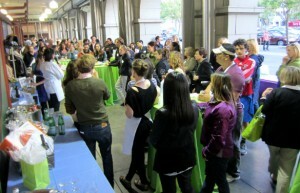 It’s been an exciting few weeks at Parties That Cook, and the San Francisco office has been humming with activity. Ever since our super successful customer appreciation events in San Francisco and Chicago, we’ve been on a mission to create something similar — and spectacular! Now, we’re happy to introduce a BRAND NEW corporate event format called Taste and Technique! This event is unique in that it’s geared towards large groups and allows each individual guest to mold their own event experience. You may be asking how such independence is even possible for a corporate cooking party. Well, let us break it down for you. It all begins with our lovely event managers and you! 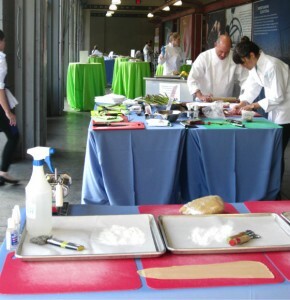 As the event host, you decide which food stations and recipes you want to work with. This means that rather than sticking with a particular themed menu, you can be as culturally diverse or technique driven as you want to be! Each cooking station will be prepped with all the necessary ingredients and manned by professional chef! 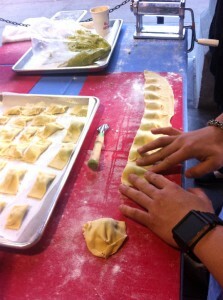 No, our chefs won’t do all the work, of course, but they’ll be able to help your group create culinary masterpieces. In addition to cooking stations, you’ll also have your choice of our interactive exploration stations. 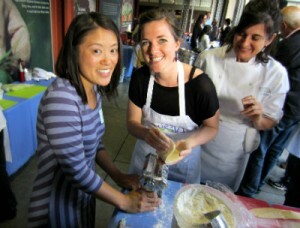 Activities like food trivia, spice blending, or skills tests offer a break from the hands-on cooking. Oh yea, and if you want something a little more out-of-the-box like wine tasting (not boxed wine) or latte art, we’ll make it happen. Once the details have been determined, we take care of the rest! Jump to the big day: your team is excited and ready to go. For the next 2.5 hours, the only thing you have to worry about is having fun. Upon arrival, we hand everyone a passport for collecting stamps at all the stations. Fun Fact: Those who collect a stamp from every station are eligible to enter to win a raffle prize! Each guest designs their own route through the cooking and exploration stations – at their own pace. 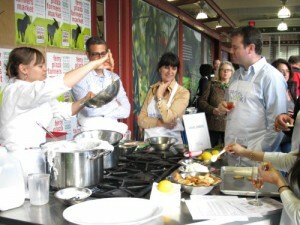 Participants are invited to taste the dish prepared at each cooking station before moving on to the next one. (Passersby are encouraged to snag a bite, too!) Tastes are constantly being created by new groups, so there is plenty of food to enjoy. As the cooking draws to a close, guests are free to relax, chat with co-workers, and enjoy the remaining appetizers being passed, reception-style. Sound like fun? Contact us and start planning your event today! Taste & Technique is perfect for large groups, networkers, early adopters, and groups looking to blaze their own trails!